At Diamond Head today, we caught an early glimpse of winter flying in October, as the first cold front of the season brought us some decent Kona winds. Out of 17 pilots at the garden, eight launched, and seven soared (some more than once). Everyone did a fine job (although poor Pete snapped 7 lines on his Magic 3 as he tried to yank his wing off of the sharp coral). On a happier note, four pilots enjoyed their first high flights there: Frank, Johan, Scrappy, and visitor Greg. 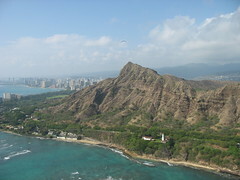 People flew until dark, and by that time Diamond Head was the only part of the island not swallowed up by the rain. It was great to see Jetflap Jeff out there looking better than ever (except for a small cast), and also Dangler back from Arizona for a brief visit, and even Alan from Cirque Hawaii stopped by. Great pics Alex. I feel like I was there. Pete, Mojos gear can get you some replacement lines pretty quick. Totally jealous! Glad you guys could get up and have fun. Winds still very south making paramotoring difficult in Pepeekeo. Nonetheless, go my first flights in on my new Revolution "Flat top" on Saturday. Eric ! I shot You a mail but maybe it got stuck in Your junk ?